One of the most exciting swim courses Ontario has to offer! A canal swim in clean clear water. The water temperature should be in the 68F to 72F range. A 2,000m single loop clockwise swim with great viewing for spectators. Calm waters and a roaring crowd will greet you as you exit the swim and run directly up the Grandstands into the transition area! The bike course is flat and FAST!! The bike course is on OPEN, and mostly quiet roads. There will be some vehicular traffic so please exercise caution and be alert. Ensure that you ride to the right-most side of the road and that you DO NOT cross the centre of the road at any time. Please make sure that you are NOT in your aero-bars going around the corners or through any intersections. Please ensure that your hands are ready and covering your brake levers for safety when cornering. Athletes will exit T1 heading towards Prince Charles Drive. Here athletes will start heading south to Forks Rd. From there, the course continues along scenic roads out towards the Wainfleet and Haldimand areas. Once you reach Hutchinson Rd. you will find yourself heading south eventually at the shores of Lake Erie, at Lakeshore Rd, the course turns left again and follows along the shoreline. The 1st Bottle Exchange is on Station Rd. just north of Lakeshore Rd. The course then leaves the shores of Lake Erie and makes its way back to Feeder Rd. using quiet secondary roads. The course heads back to Welland on scenic Feeder Rd. towards Dain City. Once you have reached Colborne St you will head parallel to the Welland Canal onto the fitness pathway and from there onto Canal Bank St. After turning left on Canal Bank Rd. you will travel north to Townline Tunnel and turn right heading east. Shortly after having made the turn and prior to entering the tunnel you will reach the 2nd Bottle Exchange. The course reaches the south end of the Niagara Falls using a dedicated coned lane, crosses over a bridge before turning right again onto the Niagara Parkway to the Bike Finish in Kingsbridge Park and T2. 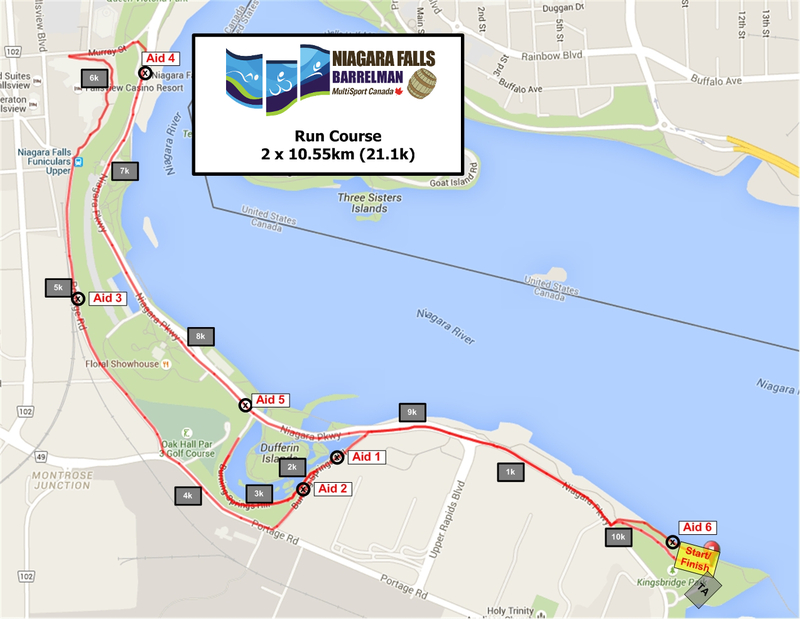 The Run Course is comprised of two loops through the City of Niagara Falls and two out-and-back sections which start and finish in Kingsbridge Park. 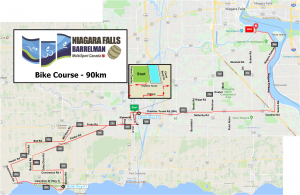 The course takes the runners past Marineland, the Niagara Fallsview Casino and Table Rock Park before passing Niagara Falls itself! You will actually pass the Canadian and American Falls twice during the run. You will exit T2 and turn onto the fitness path running parallel to the Niagara River for the first 500m until joining up with the road and turning right onto the Niagara Parkway. Running north, at approx 1.7km you will turn left onto Burning Springs Hill Rd. Once on Burning Spring Hill Rd, you will then veer right as the road splits onto Dufferin Isle Rd and run alongside the scenic Dufferin Islands. At 2.5kms you will hit the turnaround and run back towards Burning Hills Spring Rd where you will make a sharp right and tackle a short climb covered by a tree canopy before reaching Portage Rd. Spectator Hot Spot #1 Note: The Dufferin Island section is a great spot for friends to cheer you on. They can access Dufferin Islands by a stairway at the north end of the Upper Rapids Parking Area. The course then turns right on Portage Rd. and follows a coned lane north using the pedestrian pathway from Portage Rd to Murray Hill. This path runs along the Casino property at the top of the escarpment, making for a very scenic and completely traffic free experience. In order to access Murray hill, athletes will need to descend a set of stairs. There will be staff present to assist athletes where appropriate. At the bottom of Murray hill, the course then turns right onto the Niagara Parkway heading south back towards Kingsbridge park. We will have a closed lane on the Parkway dedicated to the runners. You will pass scenic Table Rock and be able to hear the roar of Niagara Falls as you pass the American and Canadian Falls. The course continues in this coned lane passing the old Toronto Power Plant eventually passing Burning Springs Hill Rd. You will continue running on the Niagara Parkway towards Kingsbridge Park. 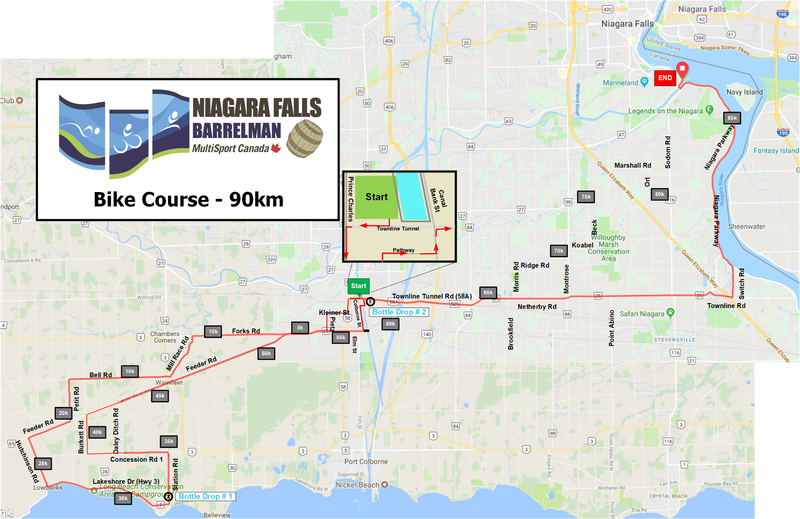 The next 1.5km takes the runners along the Niagara Parkway, turning left into the parking right turn back into the Finish area where runners will enter the finishers/lap area. Spectator Hot Spot #2 Note: This is really where all the action will be. Spectators will have an opportunity to see athletes leave T2 onto the run course, then see them again as they complete the first loop of the run and finally the FINISH! At this point you will have the option of entering the finishers chute or heading out for lap 2 of the run course. You will repeat the above sections exactly as described above again. After completing your 2nd lap of the run course you will this time take the Finisher’s chute and run the final stretch towards the finish line!